Low growing spreading bushy shrub with lax branchlets. The dark green leaves are spear-shaped, and dusky pink underneath, they emerge from purple-red leaf buds. The long flowers are red-purple fading to white in late spring to summer. 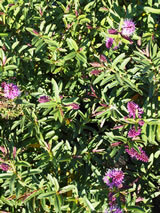 This Hebe cultivar was discovered by Ann Burton at the Annton Nursery of Cambridge. It will grow in sun or semi-shade, tolerates dry sites and a range of soils.